Oil-grease level alarm instruments are specially designed for oil-, petrol- and grease separators. The thickness of the oil-, petrol- and/or grease layer is detected by the LED’s equipped to the electronic unit. 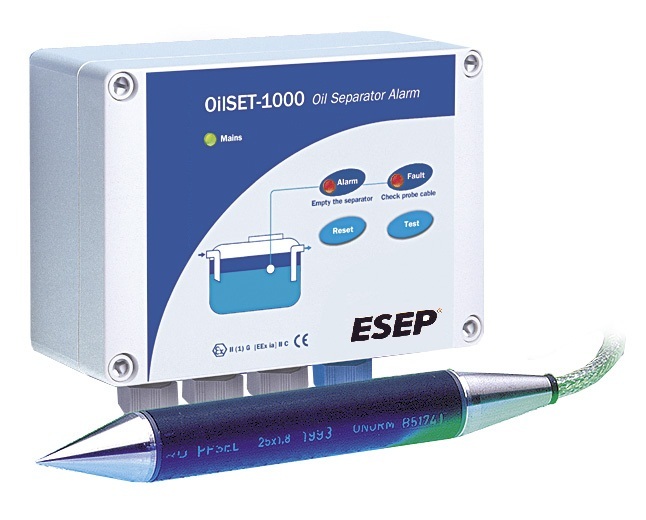 ESEP oil level alarm instruments, types OILSET 1000, OILSET 2000 and OMS 1, sludge level alarm instrument, type SANDSET 1000, grease level alarm instrument, types GreaseSET 1000 and GA1, and high level alarm, type Alarm 20220. The systems indicate when 80% of the maximum storage capacity is reached. However before 100% of the storage capacity is reached the system should be emptied. A measurement unit (the electronic unit) and the submersible sensor (electrode) with connector cable and connection unit. The electronic unit is equipped with LED’s which indicate an 80% storage, cable or electronic defect and a short-circuit. Furthermore it is equipped with a buzzer and reset and test functionalities. Some of the systems also come with a third part, for instance a high level or sludge level sensor. Accurate measurement and discrete alarm by means of LED’s and a buzzer. Prevents internal faults by signalling cable and electronic defects or short circuits. IP-classification 65 (placeable indoors).